JACKSONVILLE, Fla. - The Jacksonville City Council officially approved a new lease extension for the Jacksonville Jumbo Shrimp on Tuesday. The agreement, which confirms the Jacksonville Jumbo Shrimp's long-term commitment to the Baseball Grounds of Jacksonville, is an extension of the current working agreement and goes into effect immediately. The Jumbo Shrimp franchise, previously the Suns (1970-1984, 1991-2016) and Expos (1985-1990), has called the Baseball Grounds of Jacksonville home since it opened for the 2003 season. The Jumbo Shrimp have committed to playing baseball at the ballpark through at least the 2033 season with this 10-year extension. "Since assuming control of the team in 2015 it has been one of our top priorities to work on a lease extension that confirms our commitment to Jacksonville," said Jumbo Shrimp Owner Ken Babby. "Our fans have shown incredible support and loyalty making the Baseball Grounds of Jacksonville a can't-miss destination for Affordable, Family, Fun and with this lease extension we are stating firmly that we are committed to this community for a long, long time. Thank you to Mayor Curry, Chief Administrative Officer Sam Mousa, Chief of Staff Brian Hughes, City Council, and the City of Jacksonville for working with us in this process." The organization has experienced great success at the turnstiles at the Baseball Grounds of Jacksonville with an incredible 23% increase in attendance for the inaugural Jumbo Shrimp season in 2017. The success carried over to 2018 as the July 3 crowd of 11,762 was the largest at the Baseball Grounds in 10 years and the four crowds over 8,700 were the four largest in the Southern League this season. 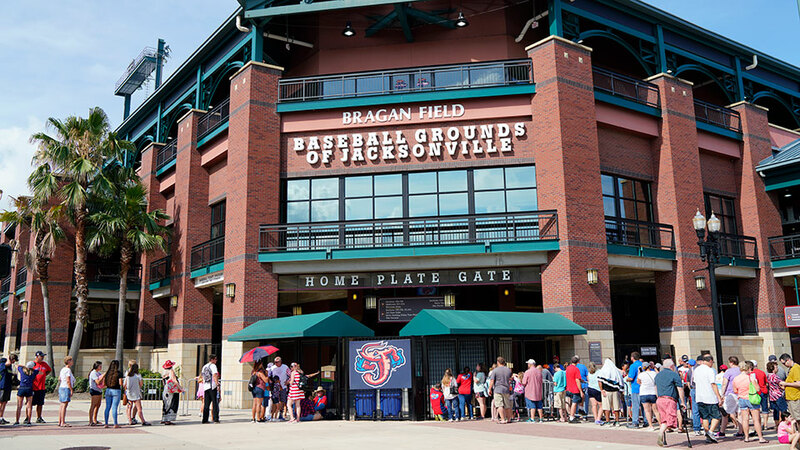 The Jumbo Shrimp's average attendance of 5,037 in 63 openings in 2018 also marked the first time since 2010 that Jacksonville has averaged at least 5,000 fans in consecutive seasons. More than 900,000 fans have attended games at the Baseball Grounds of Jacksonville in the first three years of Fast Forward Sports Group ownership. In those three seasons, the organization has invested over $1.3 million in privately funded ballpark improvements including adding the Budweiser Tiki Terrace in left field, adding the drink rails and swivel seats in the Hot Corner, remodeling all of the suites, and extending the Wheelhouse Lounge on the BDO Suite Level. The Baseball Grounds of Jacksonville opened for the 2003 season and has been the home facility for Jacksonville's Double-A Southern League baseball club as well as hosting many other events including the Atlantic Coast Conference (ACC) Baseball Tournament (2005-2008), the annual Florida State vs. Florida baseball game, the 2013 Southern League All-Star Game, the Jacksonville Armada FC soccer (2015-2016), the Wolfson Children's Hospital Run, the Shrimp and Suds Craft Beer Festival, Family Movie Nights, and more.